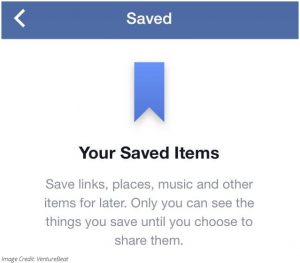 Once upon a time you could save Facebook posts. Then you couldn’t. Now it’s been brought back! Ever seen a great post whizz past while scrolling your newsfeed and thought – I’m really interested in reading that – but not right now. I’ll look at it later. Only to find that when you search later you can’t find it? Who posted it again? What was the article called exactly? I think it was around this post from my old high school friends new job update…nope, hm. You missed it. The way Facebook structures it’s newsfeed algorithm can make it tricky to go back… But now they have saved us – by letting us save them! You may have noticed that if you click the arrow in the top right of a post containing a link or photo you have the option of saving this post for later. The article will then appear on the left hand side bar on your desktop for when that time arrives that you want to return to it.